Well, with certain exceptions we could be certain those supplements didn’t work because they were meant to be anti-aging based on an incorrect premise. The premise that aging is the same as cellular degradation; that the degradation is the result of ‘wear and tear’ – especially due to high-energy molecular species like free radicals and reactive oxygen and nitrogen species produced by failing mitochondria, which only increases their failings. Now the “supplements” you specifically mention as having supportive evidence (and really, what sense does it make to test a mixture of such drugs, you’d never know that no change wasn’t an averaging of good and bad effects, would you? ), like melatonin and vitamin D3 are hormones, at both of which decrease with age, and aspirin (and other NSAIDs as well) reduce inflammation, a known exacerbator of all diseases of aging and a contributing ’cause’ for many of those diseases ( (although the real ’cause’ is the aging (developmental) process itself). The fact that mice cells age and die without shortening telomeres certainly indicates that other mechanisms exist to ensure the proper length of life – the production of alternately spliced transcripts leading to unusual and often defective forms (like the increasing concentration of progerin, a mal-formed segment of the Lamin A protein that was thought to only occur in children with a mutation that resulted in Huntington Gilford progeria, but which Francis Collins (head of the NIH) showed to occur in increasing concentration in all aging humans. The “silent” mutation in kids with progeria causes an alternate splice site to be accepted resulting in the disease – yet as people age, they too start producing it – surely that tells us splicing changes with age. And of course the accumulation of amyloid proteins – not only beta amyloid (Alzheimer’s disease) but many of the amyloidoses that, for example, make old muscle hard and inelastic – everybody knows the expression “tough old bird”. No, the answer is to set back the aging clock and this is doable – I believe that it’s being attempted right now. Thanks, Harold. I agree with a lot of what you say, in particular that the body is on a self-destruction schedule, and that protection against oxidative damage does not slow the aging process. I didn’t know the story about Lamin A, and that progerin buildup is a hazard of old age. The one thing I differ on is that I don’t dismiss the usefulness of combinations of treatments. I think these substances are likely to interact in ways that we have not begun to catalog. In other words, I don’t expect that because Supplement A adds 10% to life span and Supplement B adds 10% that taken together they will necessarily add 20%. It may be 30% or it may be zero. It’s important to begin cataloguing the interactions among various proposed remedies. I think that the number of combinations is so vast that we will have to apply some theoretical understanding if we hope to make any progress at all. “Studies that shed a new light on aging” – and you’ll know the whole truth. Now one thing I do agree with, and I”d like to start some sort of non-profit center to test the various claims of ‘nutriceuticals” including (and especially) those that purport to extend life. But I tell you – if that’s your concern – that something better (if you read my paper you’ll know) is coming – and coming soon. (That is my hope, but more my expectation) a real life extension of the best kind – immortal youth. I’ve just finished reading your paper, and found it very informative. I often wondered, why is it, if aging is caused by accumulated random damage, do we all appear to age at very similar rates and in very similar ways. You and Josh, both provide a much more credible explanation of aging and point to an achievable way to defeat or dramatically postpone it. The big question is of course, how do we get the mainstream to recognise and then act on a new paradigm? I fear there are too many vested interests such as the FDA and their clients big Pharma to move things along quickly. this is a late comers reply, so i dn’t know if it shall b seen. ive read a substantial amount of your paper & the premise does seem to b set in good logic. you may not b aware of this but your premise is in agreement with the biblical text/testimony, if you will. according to the biblcal txt, the initial life span of those 1st people was on average abot 800 + years. just prior to the testimony about the flood, God states that God’s spirit shall not always strive with man, his days shall b a 120 years. aftr the flood, according to the biblical txt, it took from noah to abraham, for that process to occur. it mght b interesting to note that according to th biblical txt, prior to the biblical flood event, only plants were available for food, & this for all humans & animals. this general range programmed lifespan does agree with the general notion of inevitable universal entropy. yes, lifestyle, diet-hgh sugr/processed carbs, war, starvation, toxins-cigarettes, industrial pollutants, low – no nutrient food-like stuff, stress & etc., may shorten one’s predetermined/predisposition life by a few years or decades, but the host given a more or most optimum circumstances, wouldn’t likely live past 120 years of age. if the blood is the transport for this system wide age/life span regulation, then your suggested experiments should prove informative, and demonstrate support of your premise. if your cited studies for your premise is as you say, which demonstrate that senescent cells have been rejuvenated in the way claimed, (it follows that senescent cells still contain the potential energy/ resource to b rejuvenated/they r not irreparable) then yes, mainstream science has again jumped to an unscientific conclusion. conventional science has it backwards. deterioration of the functionality of the cell does not cause aging, but the signaled programmed aging process causes/iniates the cellular degradation. and this is in agreement with what the biblical txt depicts in genesis 1-11. It’s odd to mix the Bible with modern aging research, but I am and have been aware of what you are saying about ages in the Bible and considered that (not as evidence, but as ‘hint’ if you would. We’ve come to find out that things in the Bible have been authenticated, but to believe that humans live 800+ years was a not-unheard-of lifespan. And you this is not just a vague reference to some people like Methuselah, in fact Abraham is the first to age somewhat normally according to the Bible, when he say that at 130 years of age his is an old man, and yet his father was a young man at the same age. Truth is I’d like to restore that 800+ years of life if it ever existed or make it exist if it did not. I believe (some day I will reveal all if successful) that my finding these secrets of aging is no accident. (Even apart from the fact that I set myself to understand aging from the beginning of my scientific career – I started with studying DNA repair in E. coli (reach 150 citations on that first major paper). Sorry, that was incoherent. Simply, science is knowledge (literally in Latin), we have eaten of the Tree of Knowledge, and the next, and to-be-feared step, according to the Bible, is to eat of the Tree of Life. Yet it was clear at the Garden of Eden, that God didn’t want humans to eat of the Tree of Life, least they become like Gods. (And didn’t want them to eat of the Tree of Knowledge, least they learn of the Tree of Life. Now the question is, why did God not want man to eat of the Tree of Life, why shouldn’t men become like gods (and women too of course), and has that changed? Funny – the ancient dream, fostered by Christianity (as Judaism has no after-life per se), of man immortal in Heaven is simply a misunderstanding by the ancients and doesn’t apply to individuals – it is better understood as mankind gaining immortality and traveling among the stars; that way we will have an infinite heaven(s) of infinite wonders, and God doesn’t have to spend the rest of eternity amusing ‘saved’ souls, the heavens will be our playground. Funny thing is there are people out there who think that God wants them to be stupid, unthinking, obedient slaves – who will throw away hard-gained truths about the world and cover their eyes with the Holy Koran or Bible, like a child covers his eyes with a blanket to keep away scary stuff. The difference is that unlike a child, they will not scream bloody murder when you try to remove the blanket from their eyes, they would rather try to kill you than to see reality. Thanks, Maniere. I know Kevin Flurkey, and trust his work. Link to the paper is here. So here again Josh’s admonition not to assume mice are men. Mice are not prone to the same diseases of aging as humans are – atherosclerosis and heart disease are not major killers in mice – and second heart attacks just don’t happen, there are no mouse ERs. So aspirin, NSAIDs in general, could help extend human lifespan and healthspan – and my guess is that unless NSAIDs exacerbated some mouse-specific disease of aging, it might increase mouse healthspan as well – there’s no indication that it was measured (healthspan, that is), to mice it may not make much of a difference (at least to the investigators), but to us it makes a big difference. Resveratrol did seem to extend obese rodent lifespan enabling them to attain normal like lifespan. Considering the epidemic of obesity in humans, this would sound promising. It’s benefits on cardiovascular health should be more influential to humans,thus likely benefiting those of normal weight. Another interesting supplement to try would be c60oo. Yes – the flurry of interest in Fullerene (C60) didn’t begin until two years ago – too late to be included in Spindler’s study, I’m sure. I wonder if he has plans, or perhaps he is already testing C60. So, as a conclusion….did you stop taking supplements? Did you limit intake to Vitamin D3 and Aspirin? Or do you still go with the mix you’ve written before on your blog? I’m still trying to figure this out, and will continue to report my thoughts. I wouldn’t recommend that you try to follow my vascillations from week to week. There are genuine contradictions in experimental results, but as we learn more of what has been done, slowly some truths emerge about what works and what doesn’t. My best thinking for the present is in the last paragraph above. Spindler has come a long way regarding the conclusions of this recent paper. Alas, the results of the LEF Lifespan project have never been published (probably accordingly to the LEF’s general policy to only ever publish positive news on supplements ;-)). Some leaked data however suggested that none of the compounds tested back then prolonged the lifespan of Spindler’s mice, CoQ10 even seemed to shorten it slightly. That makes those recent results less of a suprise. My take? Spidler is known as a genius in animal husbandry. He breeds the most vigorous, long-lived laboratory mice in the world. 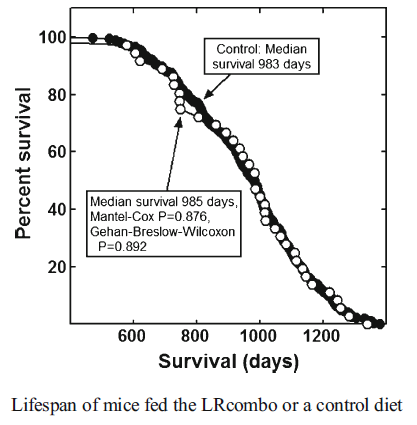 Only caloric restriction has been shown to significantly extend the lifespan of Spindler’s mice, which stands in contrast to many other studies with presumably less healthy mice, showing a prolonged lifespan with several supplements. Besides the fact that I’m a man and not a mouse, I’m not sure if I am quite as good in self-husbandry as Spindler is in mice husbandry. My genes are probably not that much optimized for longevity as those of Spindler’s mice. Moreover, quality of life matters more for me than its sheer duration. Considering all the positive evidence from human trials, I think it is still a good idea to take certain supplements. However, given all the recent negative evidence on the lifespan extending effects of dietary supplements, the “Life Extension” brand name may seem like a bit of a stretch. I’m confident that those supplements may help to “extend” the quality of life, but probably not so much the quantity. The results that have been provided are somewhat contradictory. The lifespan of humans and mice cannot be 100% compared, as it could be possible that some supplements that increased life span in mice would not work on humans and vice versa. As it has been mentioned in the article that the predominant death causing diseases in humans is not the same as in mice. So, in conclusion I think no supplement should be concluded that it increases life span for humans as there is not enough evidence to support that statement. It is better to say that there are certain supplements that can be used by humans that better the quality of life but not increase it as per such because the human anatomy is its own mechanism due to it most of the times destroying and forming it’s own chemicals and cells that aid life. More research should be done on this so that the quality and amount of evidence produced is upgraded and approved credible. Athi, credible evidence requires scientists who are open-minded (a small proportion) and funded (smaller still). There’s no money for this stuff. Right now, off the top of my head (and I’ve published it) I can think of research that really has a possibility of increasing human healthspan (and lifespan, and “youthspan”) appreciably – but right now some of the best experimental scientists are looking for the funding to carry it out. Yet that funding would cost less than some people spend for their swimming pools. It’s sad – I think we actually have a ‘cure’ for aging – but for lack of a couple of bucks, money that people are throwing away, we may not have it in time to help the vast bulk of the “baby boomers” that are now reaching senescence. Imagine a way to reverse aging – and the diseases of aging as well (perhaps, we still don’t know what it will do with senescent cells though indirect evidence provides hope that they will be eliminated). We are on the brink – but may never cross to the other side due to shortsightedness, science becoming a ‘career’, a science policy without imagination, unwilling to take chances – almost have guaranteed results (which are useless), commonsense” (simplistic thinking), the egos of prima donna scientists. What we need is an independent institute funded by the public and transparent top all to conduct these tests – perhaps interested groups of individuals would be willing to fund it? So thank you Mike. I think what was unthinkable even ten years ago is getting treated a bit differently now. People like Josh, Ted Goldsmith, Giacinto Libertini, myself and others have been talking for so long that eventually people start listening, and if what we’ve been saying is constantly reinforced by new evidence, which it has, even the most conservative biologist must consider it if they are really scientists, they have to consider the evidence. I’m totally sure that people are listening now. I am certain that clinical results are not far away. Interesting Article, Josh. I read the follow up comments with great interest. I have been a multi-nutrient supplement user all my life and I really got serious about supplementation on a larger scale in my 20s. My father was a huge Jack LaLanne fan. Because of that he listened to Lalanne’s advice and started taking a multi-nutrient supplement. He also purchased children’s sugar based vitamin lozenges for me and my brothers and I recall taking them at a very young age. I have been self-experimenting with nutritional supplementation ever since. About five years ago I added calorie-restriction mimetics such as Metformin and some nootropics. A human study is the only way to know if a nutrient benefits or extends lifespan in humans. Due to the human lifespan, however, and due to the fact that some nutrients take years to show a benefit, and are not patentable, most such studies would take too long and cost too much to conduct in a way that could draw a definitive cause and effect conclusion. So to my mind self-education and self-experimentation are the only options, for now. To that end, as a person who has been supplementing large amounts of nutrients regularly, along with my husband, I can say that it has appeared to make a vast difference in our quality of life as opposed to the lower quality of life among our peers. Many of our peers are devout NON users of nutritional supplements, refuse to use supplements, and insist that all nutrients can be obtained solely from food consumption. We do know some peers who also supplement and they, too, seem healthier than those who do not. Both my husband and I are far more healthy than our non-supplementing peers. We need no medications as do most of our peers. Many of our non-supplementing peers are on heart medications, diabetes drugs, suffer from obesity and are ill in other ways. An added bonus apparently, for me and my husband, is that based on comments from our peers and doctors, we both look much younger than our age, without the benefit of plastic surgery or fillers. I am the one who introduced my husband to nutrients. My husband began taking nutrients in his mid 30s because he noticed that we could both be exposed to people with the flu or a cold but only HE would get sick. I rarely got sick when exposed, but I was taking a cupful of nutrients each morning. About two years after my husband began a serious nutritional supplementation program, similar to mine, his uncle ran into us, after not seeing us for two years. During the conversation my husband’s Uncle spontaneously noted that I looked as youthful as two years prior but that incredulously my husband appeared to look younger than he did two years ago. He wanted to know what my husband was doing to look younger. The only thing in my husband’s life that had changed in those two years was that he began taking nutritional supplements. After a few years of supplementation, My husband has also noted that he, too, seemed to catch far fewer colds or the flu when exposed and if he did, the duration was vastly shortened. I can not yet say whether or not my nutritional self-experimentation will end with an extended life span. I can, however, say that my quality of life appears to have been improved by them. A longer life is not necessarily my goal. I prefer quality over quantity. The nutrients I and my husband ingest do, appear to have improved our quality of life. I realize this is empirical evidence and this isolated data really does not prove cause and effect. Still, I plan to continue taking nutritional supplements.. I am off to read Harold Katcher’s paper. Heather your post was great. What are the supplements you and your husband take? Sorry for the late reply. I own three businesses and the improved economy has been keeping me hopping. The nutrients I take are pharmaceutical grade. I do not want to sound like a vitamin company shill. Still I will supply a list below and a company I prefer to buy from and you can research the issue. If you do decide to take nutrients or herbs please ensure that they are pharmaceutical grade and the herbs standardized. Also, if you are taking prescription medications, please talk to a traditional MD, advertising that he/she is open to supplements and savvy about nutrients and medication interactions. Or, at least research nutrient/herb/medication interactions before taking any supplements. As mentioned in my prior post, I also self administer 250 mg of Metformin in the AM and PM for the reported anti-aging benefits. Since adding the Metformin I take a B complex supplement with Methylcobalamin ( an active form of B12 that is more easily assimilated ) because Metformin depletes B12. I also self-administer low does aspirin. If I am exposed to a person with the flu or a cold or Pneumonia, I immediately and temporarily take additional sublingual Zinc, sublingual Elderbery extract (Sambucol), and additional Vitamin C complex, for about three days. For me, I prefer to use Life Extension nutrients and herbs because this company sells combination products with several nutrients or herbs stacked together in one pill thereby creating a pharmaceutical-grade formulation that requires the ingestion of fewer pills. I will name the basics supplements I take and perhaps you can research the formulations online to view the individual ingredients included in each formulation. I have also put a double star in front of the supplements that I believe are the most important to start with, if you do not want to take too many supplements or if your budget is limited. The starred supplements will provide the minimum basic supplements that I think are important. There are two more supplements that I forgot to add and that need two stars. I alternate days between the super omega formula and the super Omega with krill and Astaxanthin. I do not take them both on the same day. I only take one per day not the dosage on the bottle, but that would be up to you. I think what you are taking makes sense – but I am confused, Leonard Guarente established that nicotinamide riboside increased lifespan in mice, so I would list them as supplement shown to increase lifespan in mice. Of course, as Josh states clearly, people aren’t mice; to mice, vitamin C is not a vitamin as they make it themselves. As mentioned, I am self experimenting and reporting subjective results. With respect to anti-aging therapies, people need to read all the pertinent research and draw their own conclusions. I feel better when taking the Ubiquinol form of COQ10. Cardiovascular disease runs strongly in my family on both sides. I have no signs of any cardiovascular disease. Some studies mention massive doses. Some are not using the Ubiquinol form. As you likely already know, with any substance natural, chemical or synthesized, dose makes the poison. Even too much water can cause hyponatremia and death. I even gave the Ubiquinol form of CoQ10 to my ten year old rescue Labrodor, taken from a young neighbor who could no longer care for him. The dog was a purebred. These dogs are genetically prone to many types of heart disease. The dog live to be almost 18 years old, 17 and eight months, and was relatively active until death. Slowing down some, but still walking. My vet was astounded. The average lifespan for a Labrador is 12 years. It did not shorten his lifespan. A cousin who was never a supplement advocate who was diagnosed with heart disease started taking Ubiquinol form of CoQ10 and has had positive benefits and has been able to lower all his prescription medications and eliminate some. He takes 50 mgs twice per day. He is thinking of increasing the dose to 100mgs twice per day. I realize of course that I again supplied anecdotal evidence. The dose of Ubiquinol is not definitive at this point. But many shows dosages up to 200 mgs per day to be safe. The optimum dose may differ with each individual and may differ at various ages. The life form discussed may also make a difference. I posted a link below regarding C0Q10 and a worm study. With regard to (nicotamide riboside, niagen, B3, etc) in a rat study. There is also a human study. Here is a human clinical trial you might find interesting. A small short study. “This trial shows that oral NR safely boosts human NAD+ metabolism,” Brenner says. “We are excited because everything we are learning from animal systems indicates that the effectiveness of NR depends on preserving and/or boosting NAD+ and related compounds in the face of metabolic stresses. Because the levels of supplementation in mice that produce beneficial effects are achievable in people, it appears than health benefits of NR will be translatable to humans safely. NR is Water soluble. Therefore, I would not hesitate to experiment with a 150 to 250 mg dose, daily. Also, Vitamin C is water soluble. I have not experience side effects accept for gas if taken at too high a dose. Dogs also make vitamin C. Still I gave my Labrador dog, vitamin C at between 500 to 1000 mgs per day. It caused no side effects, even though dogs manufacture their own C. It certainly did not shorten his life span. Also the study you mention with respect to decreasing life span was a 2002 study, I believe. Nutritional therapies are dynamic an constantly evolving as new information is gathered. Still, IMO, the Ubiquinol form of CoQ10 is something I will continue to take, based on my subjective reaction to it.